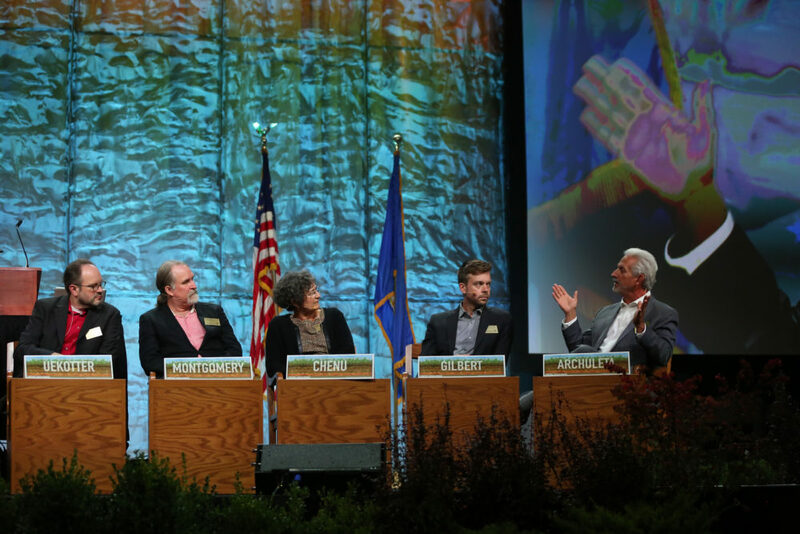 The 54th Nobel Conference, Living Soil: A Universe Underfoot, brought together seven world-leading experts on issues of soil health along with thousands of learners at Gustavus Adolphus College October 2-3. David Montgomery kicked off the conference with a lecture on conservation agriculture, encouraging the three pillars of soil conservation: ditch the plow, cover up, and boost diversity. “It is not a question of organic versus conventional farming but of understanding ecology,” the 2008 MacArthur Fellow said. By practicing no-till agriculture, utilizing cover crops to prevent soil erosion and bring nutrients back to the earth, and planting a diversity of crops, Montgomery laid the case for an agriculture that is both economically viable and ecologically responsible. “We cannot ask soils to sustain our way of life forever,” said speaker Claire Chenu of AgroParisTech, the Paris Institute of Technology for Life, Food and Environmental Sciences and U.N. Special Ambassador for the International Year of Soils in 2015. Her lecture discussed soil management for crop production, focusing on the role of organic matter in carbon sequestration. Chenu also focused on how carbon stored in different environments — more in forests and less in cities, for instance — and the implications of protecting different ecological systems. Rattan Lal closed the afternoon session of the first day after being awarded an honorary doctorate by President Rebecca M. Bergman on behalf of Gustavus Adolphus College. Lal, who is a member of the Intergovernmental Panel on Climate Change team that received the 2007 Nobel Peace Prize, spoke about his research on the use of agricultural soils’ ability to sequester carbon and the implications that no-till agriculture could have on global climate change. Local farmers demonstrated various tillage methods and their effect on the land at “Till Hill” on Tuesday afternoon. 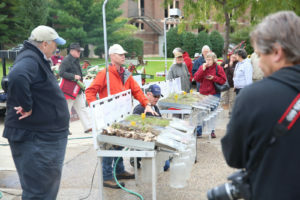 After the first day’s lectures, the speakers met in small groups with Gustavus students while other attendees explored the student-run Big Hill Farm, learned about plows and different tilling techniques’ effect on soil in the Johns Family Courtyard, or attended a lecture by Francis Bettelyoun, Coordinator of the Native American Medicine Gardens at the University of Minnesota. In true liberal arts fashion, the Nobel Conference included time for the arts, with Gustavus ensembles opening each session, the Hillstrom Museum of Art hosting an event, a Nobel Literature Prize event hosted by the theatre and dance department, an interactive dance at Big Hill Farm, and the Nobel Concert featuring professional musicians and Gustavus faculty to close the evening. Environmental historian Frank Uekotter kicked off day two of the conference with a humanities-focused lecture on what our practices with regards to soil health say about us as humans. Then Ray Archuleta took the stage, discussing — even evangelizing at times — how we can best balance the health of the soil with the economic realities of agriculture from a producer’s standpoint. “Nature, overall, is collaborative,” Archuleta said, arguing that society needs to move away from long-held narratives about controlling the land or bending nature to mankind’s will. 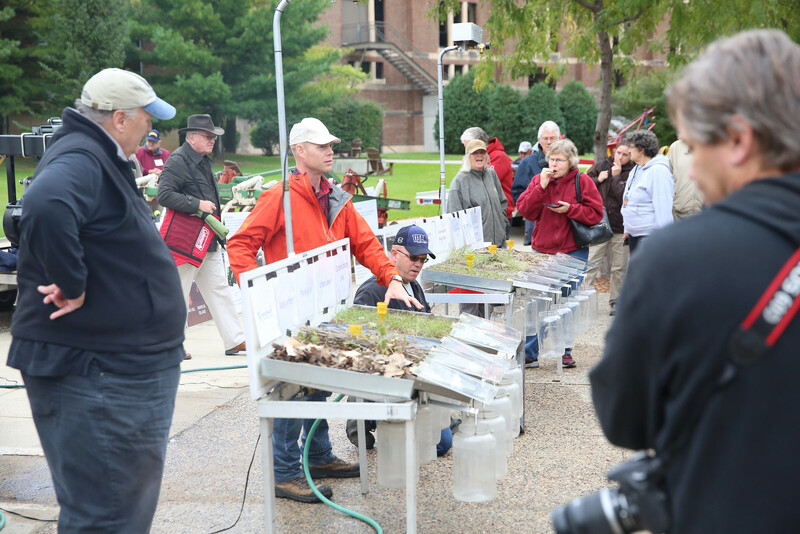 After the lunch break, Jack Gilbert, co-founder of the Earth Microbiome Project at the University of Chicago, lectured on the biodiversity of humans and the worlds soil, and what this diversity means for human beings. 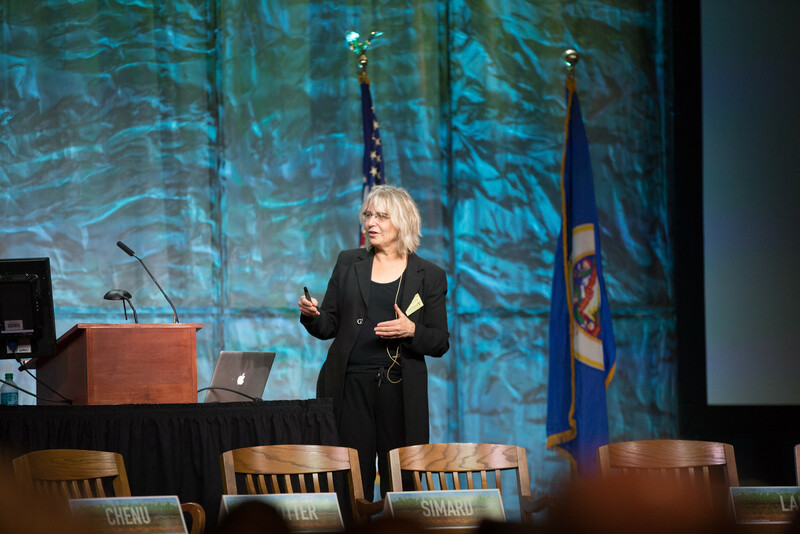 Suzanne Simard gave the closing lecture of the 2018 Nobel Conference on soil health. Suzanne Simard, professor of forest ecology at the University of British Columbia, concluded the presentations with a discussion of “mother trees” and how plant systems can communicate about resources and threats across organisms using a connection of fungus and microorganisms called mycorrhizal networks. The conference, which was co-chaired by Gustavus professors Laura Triplett and James Dontje and directed by professor Lisa Heldke, concluded with an intimate dinner banquet featuring locally-sourced foods complemented with thoughts shared by conference speakers and local agriculture producers. The 55th annual Nobel Conference, Climate Changed: Facing Our Future, will take place on the Gustavus Adolphus College campus September 24-25, 2019. The conference will feature speakers including Richard Alley, glaciologist, Penn State University; Amitav Ghosh, novelist, historian, essayist; Gabriele Hegerl, statistical climatologist, University of Edinburgh; Mike Hulme, climatologist/geographer, University of Cambridge; David Keith, climate geoengineering physicist, Harvard University; Diana Liverman, geographer, University of Arizona; and Sheila Watt-Cloutier, Canadian Inuit advocate and political representative.